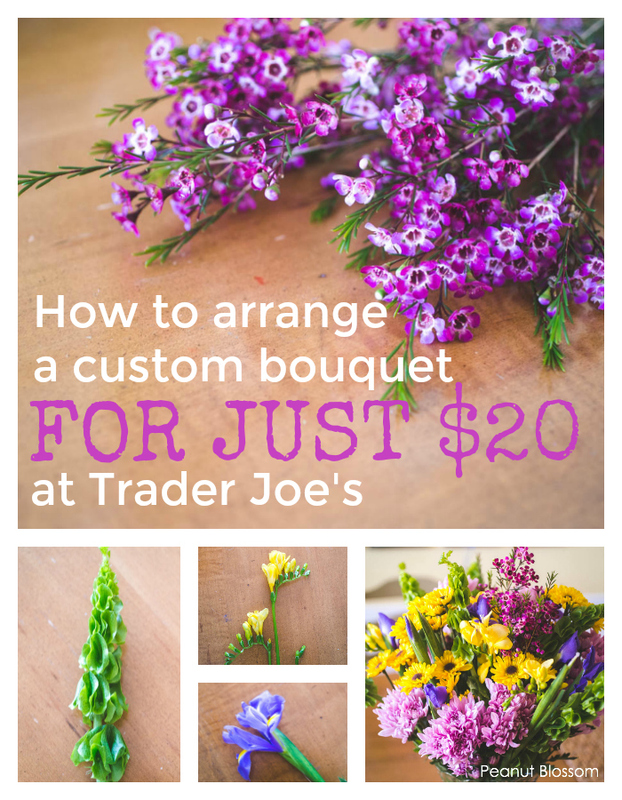 Use just $20 of Trader Joe’s flowers to make a stunning bouquet that mimics arrangements that would cost more than $80 anywhere else. Part of our family birthday tradition includes a big bouquet of fresh flowers for the dinner table. 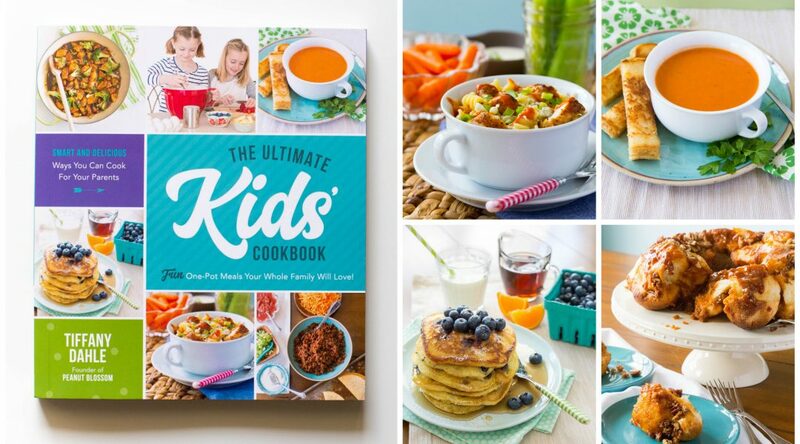 Growing up, my mom would always try to coordinate the flowers with the theme of our party or the colors of the decorations on the birthday cake. 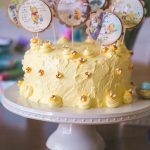 It is such a sweet and simple touch that makes an at-home birthday party feel super special. I’ve always been obsessed with flowers. When Tim and I were young and engaged, I took a part-time job in a flower shop to help fund our honeymoon vacation. It was the best retail job I ever had, I loved every minute of it. The shop was known for their wedding arrangements and I eventually “graduated” to assisting the floral designers in the back prepping the flowers and arranging bouquets to match their designs. It was my time spent in that flower shop where I learned to appreciate really gorgeous flowers. Those boutique arrangements would sell for $3 – 5 PER STEM and would easily cost $50 – $80. She shops at Trader Joe’s! 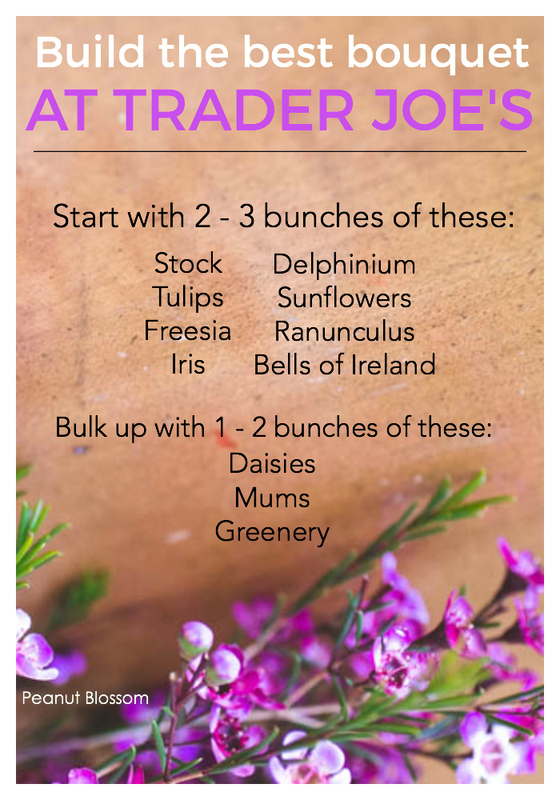 I’ve shared my favorite 10-minute dinners Trader Joe’s meal plan before, but I also have a deeply passionate love for the Trader Joe’s flower department. They carry some of my very favorite flower varieties at dirt cheap budget prices. 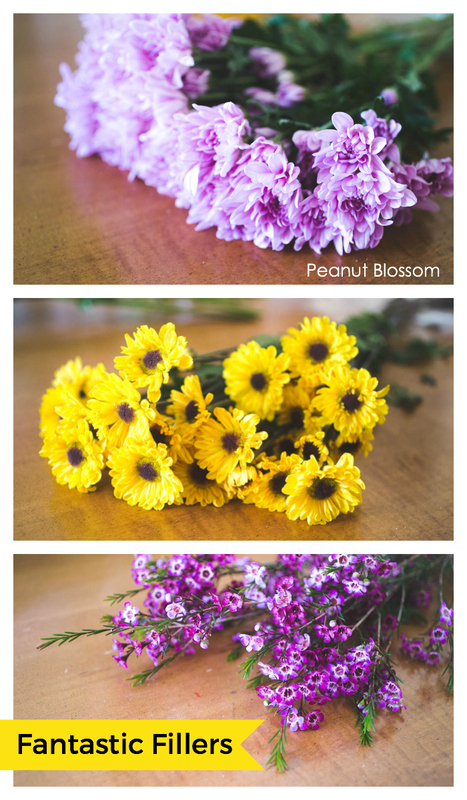 The same flowers that I used to sell for $3 – $5 per stem can be bought for $4 – $5 for an entire bunch. Check out the ginormous bouquet I created for the Peanut’s birthday last week. The core of this bouquet cost a total of $20. I splurged and added two filler flowers for extra bulk for an additional $6, but the bouquet didn’t “need” them, I just happen to have a really large vase. When I shop for Trader Joe’s flowers, I am almost always stopped by another customer who compliments the mix of flowers I grab. They look at my cart full of stems and then back at the display and I can see the confusion on their faces. 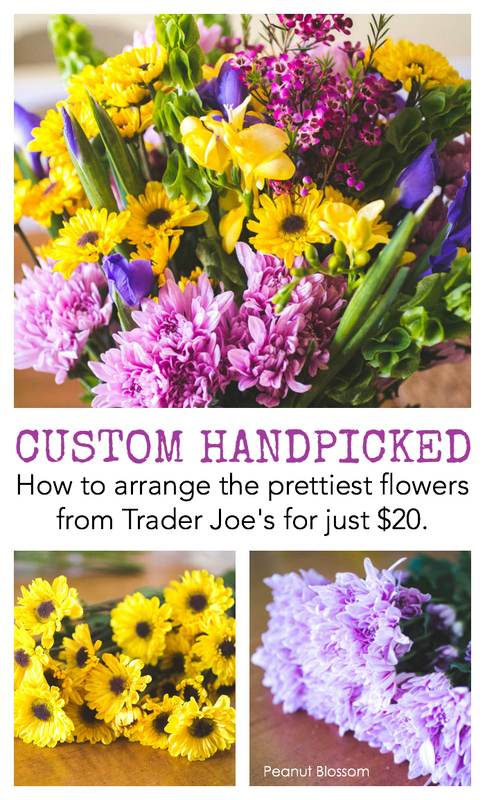 Everything looks so pretty at the store, but how do you pick the right Trader Joe’s flowers for bringing home for a single bouquet? When I first get to the Trader Joe’s flower department, I scan their displays for the flowers that will make the biggest impact in my bouquet. I might have a color palette in mind, but usually I just work with what they have in stock. Bells of Ireland, $4.99: This is one of my all-time favorites. It is STUNNING in a bouquet and is known for giving your flower arrangement height. If Trader Joe’s has it in stock, I almost always grab one bunch. Freesia, $4.99: I’m sure they’ve had it before, but this was the first visit where I noticed freesia as an option. It came in that gorgeous buttery yellow or a brilliant purple. 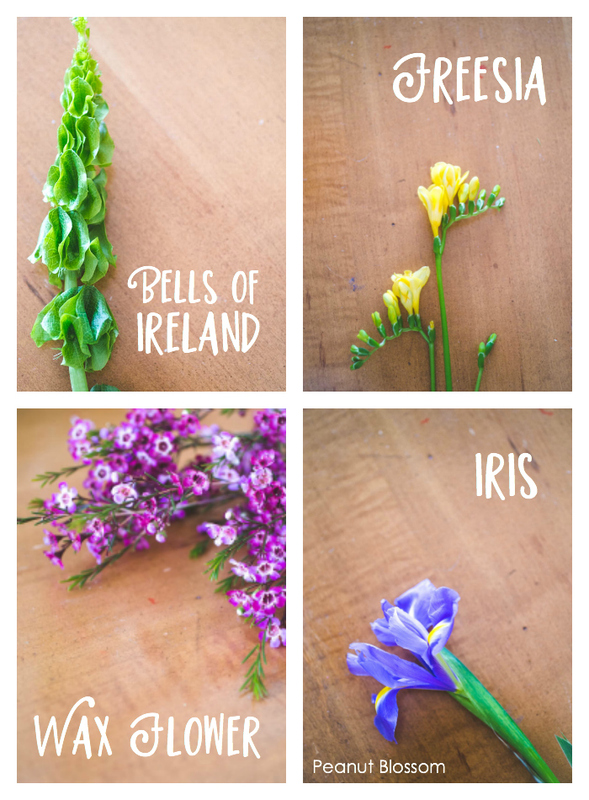 Not only does freesia smell amazing, but the little unopened buds on each stem give your flower bouquet a sense of texture. Wax flower, $3.99: These tiny purple flowers are my favorite for sprinkling in as a delicate filler for many bouquets. I’ve also seen them in light pink and white. Iris, $4.99: These gorgeous seasonal flowers were in the front display at Trader Joe’s when I walked in. They had them paired with the freesia and pretty yellow daffodils. I love that Trader Joe’s will do those flower groupings to help get you started. The iris were still pretty closed up that day but I knew they’d open up at home which makes the flower arrangement more interesting the longer you have it. Coming in at just under $20, I could have stopped here. Those four flowers along would have made a gorgeous bouquet with the right vase. The one I use at home for birthdays has a really wide mouth, so I was willing to spend a little more to get filler flowers to bulk it up. Mums, $3: I’m normally not a big fan of mum flowers. They often come in fall colors that are not my favorite. BUT if you can find them in white, yellow or this gorgeous purple, they add amazing bulk to your flower arrangement for very little money. Daisies, $3: Those bright yellow daisy flowers were the perfect cheerful complement to the bouquet I wanted to build. I was trying to go for a bit of a “wildflower” inspired theme to go with the Peanut’s 100 Acre Woods birthday. Happy and long-lasting, you really can’t go wrong with daisies. Wax flower, $3.99: It’s technically a filler flower since it is bushy and runs on the cheaper side of things but I love it SO MUCH that I count it as the anchor of most of my bouquets. The easiest way to make a gorgeous flower bouquet on a budget is to stick with either a monochromatic or two-color theme. Green counts as a neutral color, you don’t need to count something like the Bells of Ireland as one of your colors when picking your theme. The bouquet above would be considered a two-color bouquet. When you start introducing more colors than just the one or two, it can be tricky to find the right balance without spending more money than you intended. 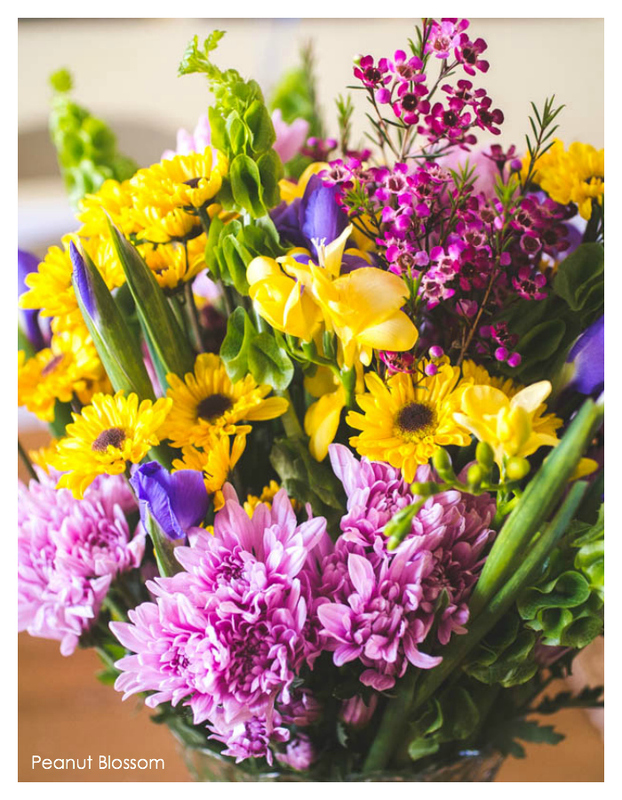 You could mix and match most of the flowers I’ve mentioned and just choose all purple or all yellow for a stunning bouquet. I love how the iris have both purple and yellow and help tie in the combination of flowers. Red is such a bold flower color, I tend to use it monochromatic bouquets. I also love all-white flower arrangements. If you want a pocket guide for referencing at the store, I made this graphic for you to save and reference. This step could honestly take up an entire post. I hope to make a video for you that shows my tricks for preparing the flowers for the bouquet and how to arrange them in a vase. Fill your vase with water first. Use water that is at room temperature or slightly chilled water, not ice cold and definitely not hot. Hold your flower stem up to the vase. Remove as many of the leaves and extra mini-branches that would be submerged under the water level. They take up too much space in your vase and can cause rot faster. Trim at least 2-inches off the bottom of each stem and immediately place it in the water. Stagger the heights of the stems, some should be tall and spiky and some should round out the bottom. Rotate your vase as you fill it so the bouquet looks great from all sides.